You deserve to have it all on your wedding day. That includes delicious food and first class service. Whether you choose one of our elegant packages or customize your own menu, we’ll make your dreams a reality with a mouth-watering meal at a reasonable price. * Minimum 50 adults for all wedding packages. Each package is served family style, with the exception of the Diamond Package which is served sit-down style. Note: These can be added on to any package. Elegant family-style package includes appetizers, salad, choice of two meats, potato, vegetable, Silver Bar, and cake. 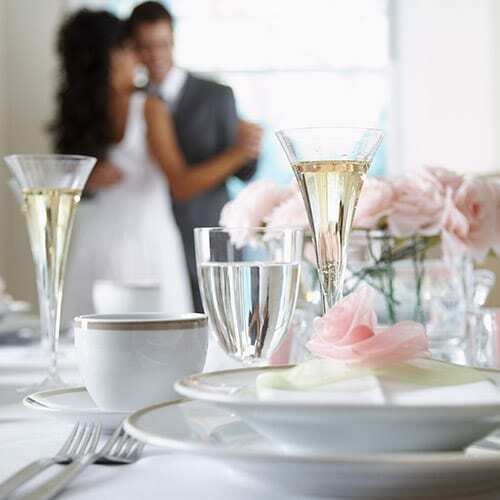 Many amenities such as choice of colors for linens and tablecloths – and more. Includes everything in Sapphire package – plus Gold Bar service and an additional choice of pasta for the main entrée. Includes everything in Emerald package – plus Platinum Bar service, a main entrée consisting of a combination plate of Filet Mignon and Lobster Stuffed Chicken, pastry table, and chair covers with bows to compliment linen napkins and tablecloths. Served sit-down style. Family-style includes appetizers, salad, choice of three meats, potato, vegetable, pasta, Silver Bar, and cake and many amenities. Does not include linens and tablecloths. Minimum 450 adults. Sit-down style meal includes salad, choice of three pastas, choice of one entrée, choice of one side dish, and cake or dessert. Does not include linens and tablecloths. Includes salad, choice of two entrées, choice of one side dish, vegetable and cake or dessert. Does not include linens and tablecloths.